Quick, accessible information is why you use a software system – that’s why Jackrabbit offers built in Immunization and Medical tracking. Our tracking system even alerts you when medical records need to be updated, then provides tools for letting parents know that action is needed. We often hear that schools would LIKE to use this feature, but they are either hesitant or face resistance to changing a system that has worked in the past. Here are the top myths about using software to keep up with due dates of medical items or immunizations – busted! Since I need to keep paper copies, there is no point in entering them electronically. The value in entering due dates and marking them complete in Jackrabbit lies in the communication, alerts and reporting tools you gain. Yes, paper copies may be necessary to keep in a student’s file to show the inspector, but you don’t want to thumb through tens or hundreds of files each month to see what items need attention. Alert: Dashboard Alerts automatically tell you if anyone is due soon (30 days) or overdue. Report: Print for everyone, those overdue or just those who will be due soon. 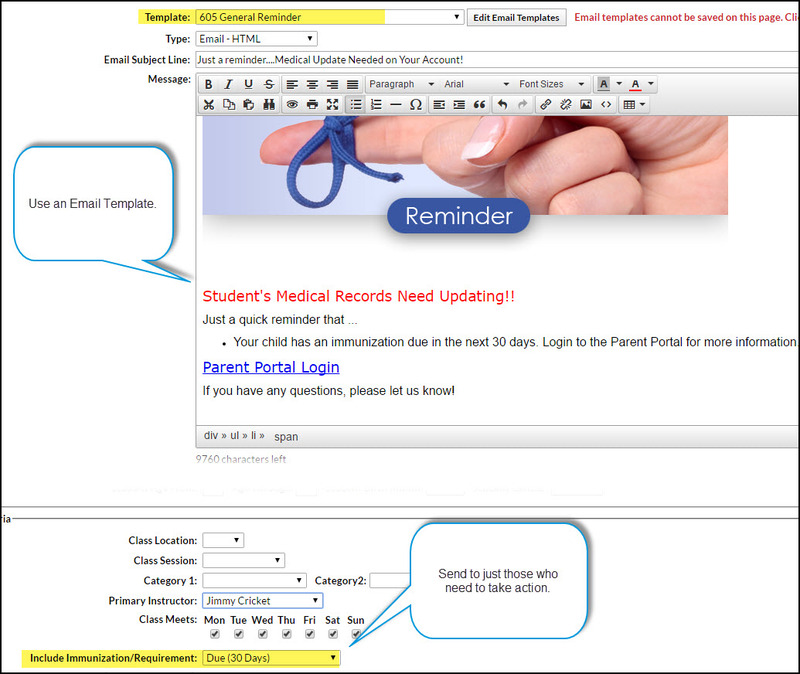 Communicate: Our parent portal easily shows caregivers if their child is up to date. Also, easy email filters let you remind parents that an update is needed with the click of a button. I need custom due dates, not just “due at X months old,” so entering them electronically won’t work for me. Custom due dates can easily be setup in Jackrabbit. Check out our Help article on Custom Due Dates for Immunizations/Reqs. It takes too long to enter this information in! Some simple setup when you enter the student is all it takes to get up-to-date alerts and reports telling you which accounts need attention. So, what is holding you back? Integrating your Medical tracking with Jackrabbit is a no-brainer! Your parents stay up to date, you stay up to date, and most importantly, your kiddos stay healthy! For more details on how to use this feature, check out our Help Center section dedicated to Immunizations / Medical Req's.